Been diving in Crinoid Canyon? Please Vote! 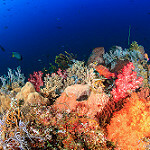 This dive site is one of the worlds best dive sites to see Crinoids. These amazing creatures are often called feather stars or sea lilies and the area is home to large numbers of these amazing creatures. Crinoids get their name from the Greek word Krinon that means lily. The dive site is located in a small cove that is found within at Damasi Bay at Nusa Kode Island. It is found directly opposite Yellow Wall on the other side of the bay. 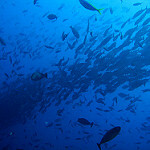 The dive site can be visited all year around with the best months being April to November. Water temperatures range from 23 degrees to 28 degrees and the site depth has a maximum of 28 metres. Visibility is usually very good and can reach 30 metres although it averages around 15 metres. Currents are weak and this dive site can be visited by divers of all levels. At this dive site Crinoids are found in vast numbers but divers can also find many crabs, tiny shrimps, sea stars, sea urchins, and many different nudibranchs. Divers begin the dive by descending down to about 25 metres, and then making their way along the wall towards the surface of the dive. The wall is the highlight of the dive as divers can spot the many different crinoids coming in different sizes, colours, and shapes. These can look amazing with morning sunlight shining down on them and so most divers complete this dive in the morning. Map of Komodo, Crinoid Canyon dive site.